The Paris auto show is difficult, and not just for its multiple halls – sans ventilation, it seemed, this year. Or for the ever-present danger of a transportation strike: "Ze situation on ze ground," quipped our rented pilot upon landing at Charles de Gaulle, "is, as usual, total confusion." No, Paris is most challenging because the auto show has to compete with Paris itself: the Eiffel Tower, the Arc de Triomphe, the national monuments to war dead and to Jerry Lewis. You’d think it would get an inferiority complex in its own ‘hood, never mind in comparison to other international shows in Frankfurt, Tokyo and Detroit. Not so in les halles of the Paris show. Total confidence was displayed by the exhibitors. How else to explain the introduction of the Mini, the quintessentially British car — by BMW, in a press conference delivered entirely in German? Or the, um, gall to schedule 15-minute intervals between press conferences a half-mile apart? 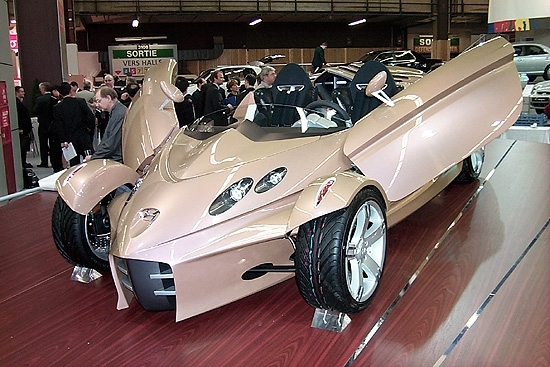 Herewith, the best of the rest for le Mondial de l’Automobile 2000. 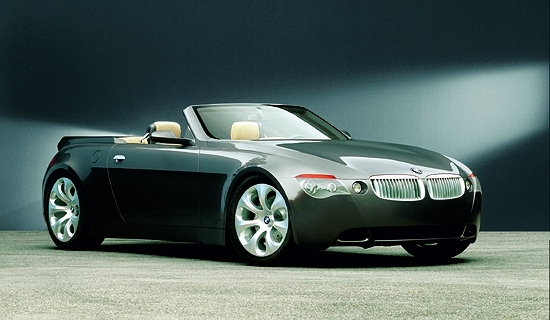 BMW Z9 Convertible Take BMW’s ungainly concept from the 1999 Frankfurt show, remove its lid and add a new way of turning on the radio and you’ve got the Z9 Convertible. BMW says the Z9’s laminated carbon skin gives it stiffness like no other roofless car, and the 286-hp 4.4-liter V-8 beneath that skin motivates it like no BMW before. A new driver interface dubbed "iDrive" (isn’t that a dot-com?) uses a gear-shaped lever to control eight different categories of cockpit controls, such as ventilation and the sound system. Twenty-inch tires in front, and 21-inchers in the rear, add to the somewhat surreal atmosphere. BMW M3 Nothing surreal here about BMW’s latest M3, destined for the U.S. early next year and destined to become a classic, with a six-speed manual gearbox and 333 hp. The newest M3 retains its straight-six engine layout, and the transmission is in fact carried over from the last-generation screamer. 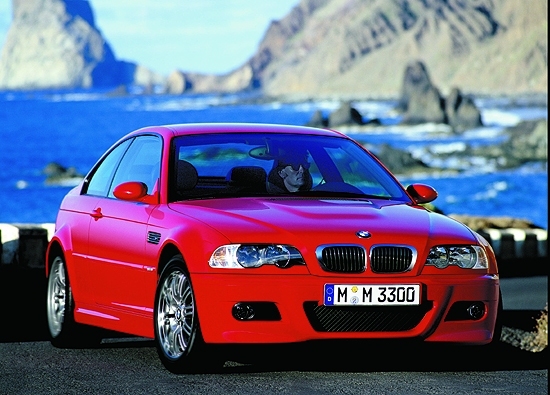 BMW says 62 mph arrives in about 5.2 seconds, on its way to a top speed of 155 mph. A new Variable M Differential Lock helps the M3 retain traction when the rear wheels light up on surfaces with varying levels of grip. Eighteen-inch tires on handsome new wheels keep it Velcroed to the pavement. FERRARI 550 BARCHETTA When Italians make requests for "personal favors," wise men comply. So when Ferrari asked Sergio Pininfarina to design a special edition of its 550 Maranello, his answer was predictable. Hey, fougeddaboutit! Thus was born the 550 Barchetta Pininfarina, a front-engined, 12-cylinder roadster with 485 hp that drops the 0-60 gauntlet in 4.4 seconds, and hits a top speed of 186 mph, according to Ferrari. GREEN AND LEAN Saab’s latest fuel-economy technologies rely on some deceptively simple ideas to reduce emissions and increase fuel economy. 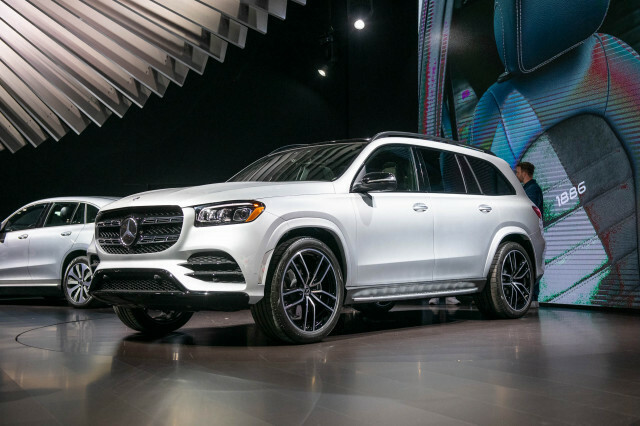 At Geneva, Saab announced its Saab Variable Compression (SVC) concept, in which a moving cylinder head and a supercharger combine to allow a constantly changing compression ratio between 14:1 and 8:1, depending on the driving load. Saab estimates SVC it could generate fuel-economy savings of 30 percent in applications. 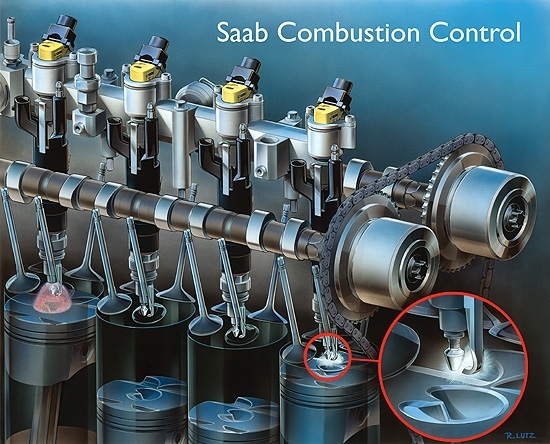 At Paris, Saab previewed another technology, the Saab Combustion Concept (SCC). 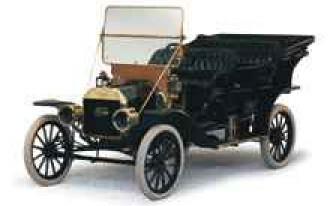 SCC draws exhaust gases in to partly fill the cylinder chamber along with a standard-ratio charge of fuel — in essence, using the exhaust gas as a "cushion" to produce nearly the same piston movement as a larger amount of fuel. 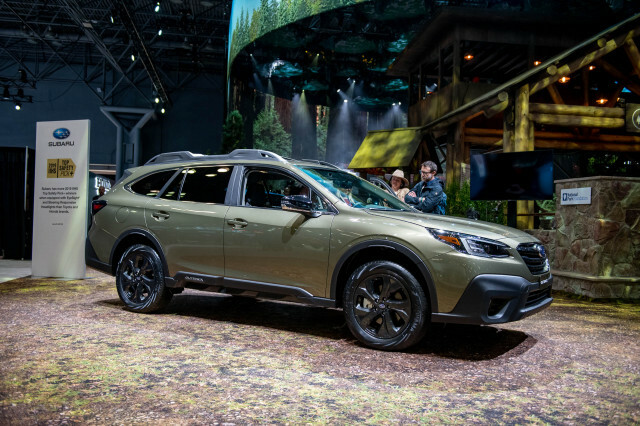 It effects a theoretical 10-percent fuel economy increase, while halving hydrocarbons emissions and cutting nitrogen oxide emissions by 75 percent. Saab isn’t saying when or if either of these technologies will reach the market, but interestingly, SCC was shown at Geneva adapted to GM’s never-seen-before, global four-cylinder L850 engine, while the SVC was demonstrated to journalists using a five-cylinder engine that one official hinted might belong to a future GM engine program. PASSAT PROBLEMS Hilarity ensues, and PR people get very nervous when the Big Chairman is in the house and the show cars don’t work. As VW chairman Ferdinand Piech announced the facelifted Passat (more chromework, slimmer headlamps), it became apparent that the hoods of both display cars were agape. Try as they could, the flunkies couldn’t push them closed discreetly. 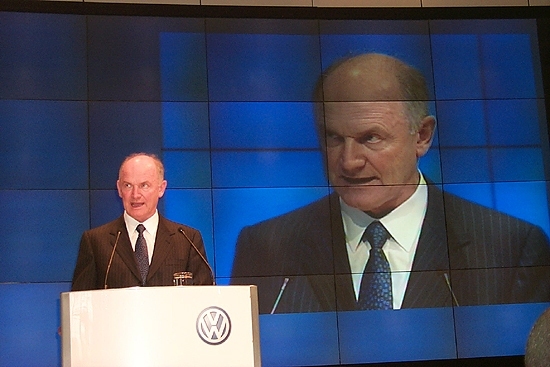 So Herr Piech gets up from his chair once more, crosses to one car, and slams it shut – with a smile. Breathing begins again. For those paying attention, the Passat gets a more Audi-like nose, with xenon headlamps, clear taillamps, a better grade of finish inside, and available 4Motion all-wheel drive. On the Audi frontier, Piech hinted that Audi’s long-in-development W-12 engine would be ready soon for customers – he’s been driving one for months, apparently – but announced no firm production date. 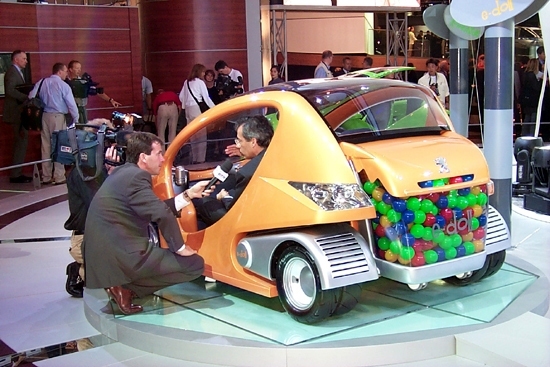 CITY STREETS SMARTS Probably the coolest vehicles we’ll never see in the U.S. were offered by Peugeot. France’s pride and joy offered a quartet of city vehicles that make the DaimlerChrysler Smart car look dowdy. 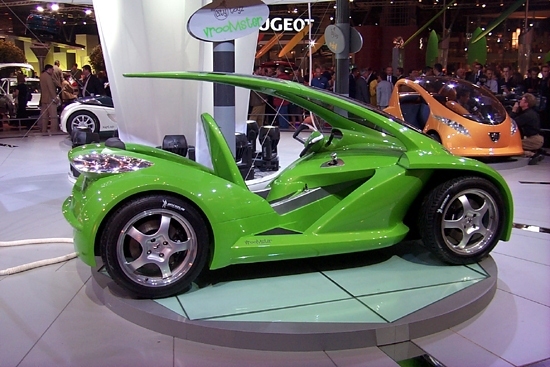 The better of the four were the frog-green Vroomster, a two-person carbon-fiber vehicle with the uncomforting "gas tank between the legs," as well as a 110-hp four and a large canopy windshield. 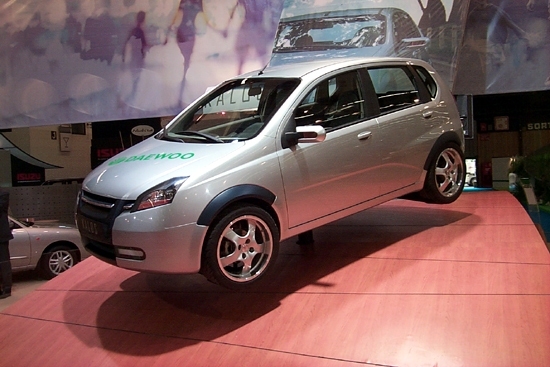 The electric-powered e-doll, on the other hand, seats three across and also has a canopy roof. The controls are patterned after motorcycles, with twist-grip gas and twin-dial instruments. 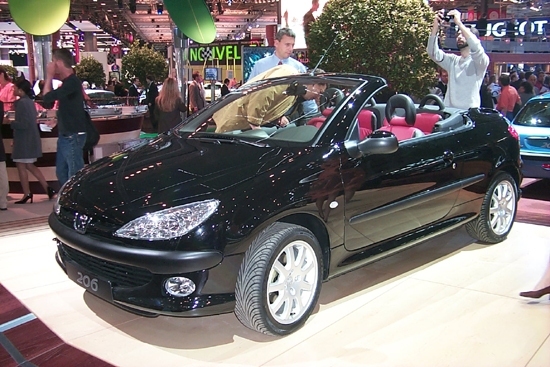 PEUGEOT 206CC A little closer to reality, Peugeot offered the 206cc – not cubic centimeters, but for coupe de Coeur ("of the heart"), which they say is "just a touch rebellious, with its plunging feline bonnet." Ahem. 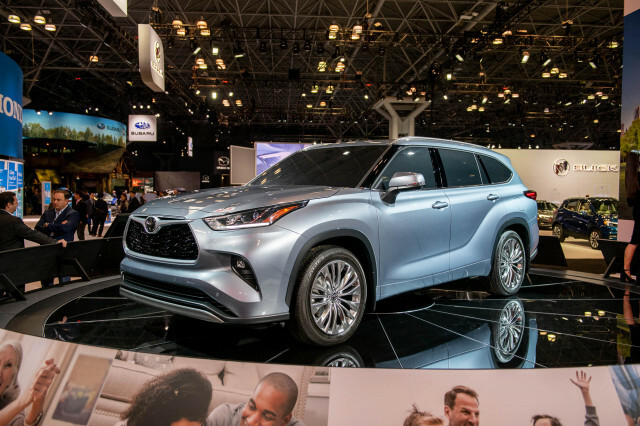 Two-plus-two seating and a retractable rigid roof enliven an otherwise ordinary 206, with a choice of either a 1.6-liter or a 2.0-liter four. DAEWOO KALOS Clearly, Daewoo is not shy about taking Toyota to task. The Kalos concept car is aimed at Toyota’s popular Yaris subcompact (it’d be an ECHO in the U.S.) and it’s looking for a production slot two or three years in the future. The Kalos is a five-door hatch that might spawn a four-door and a three-door. Three four-cylinders would be offered under the grand scheme – that is, if Daewoo survives the coming weeks and another round of international auctions that make a listing on eBay seem a distinct possibility. 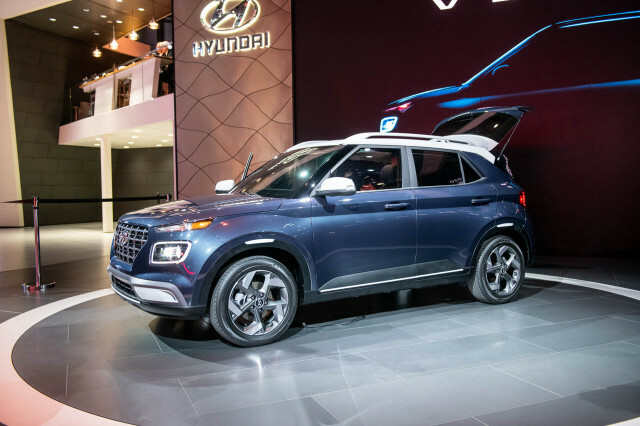 HYUNDAI NEOS The name says it’s all new, and it’s true – you’ve never seen anything like the NEOS (for New Evolution Open Sports Car) from Hyundai. What they’re saying here is they’ve arrived – and they’re getting there with a butterfly-doored, four-cylinder-powered speedster with 250 hp and an F1-style sequential six-speed gearbox. Of course, there’s no telling when it might reach a showroom.